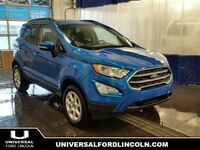 As its name suggests, this Ford EcoSport is a sporty, compact crossover offering an economy-minded package. This canyon ridge metallic SUV has an automatic transmission and is powered by a 1.0L I3 12V GDI DOHC Turbo engine. Driven via that spritely motor it gets 8.6 L/100 km in the city and uses just 8.1 L/100 km out on the highway according to Transport Canada.